The Walking Dead is an American post-apocalyptic horror television series for AMC based on the comic book series by Robert Kirkman, Tony Moore, and Charlie Adlard. The series features a large ensemble cast as survivors of a zombie apocalypse, trying to stay alive under near-constant threat of attacks from the mindless zombies, colloquially known as "walkers". However, with the fall of humanity, these survivors also face conflict from other living survivors who have formed groups and communities with their own sets of laws and morals, often leading to hostile conflict between the human communities. Andrew Lincoln played the series' lead character, Rick Grimes, until his departure during the ninth season. Other long-standing cast members have included Norman Reedus, Steven Yeun, Chandler Riggs, Melissa McBride, Lauren Cohan, and Danai Gurira. The series is exclusively broadcast on AMC in the United States and internationally on Fox International Channels prior to the 2019 Disney-Fox merger, and then subsequently on Disney Channels Worldwide. The series premiered on October 31, 2010, and in February 2019, AMC renewed the series for a tenth season, which is expected to premiere in October 2019, and stated their intent to continue further development of the series and related media. A spinoff series Fear the Walking Dead first broadcast on August 23, 2015, and is renewed for a fifth season. AMC has announced plans for three films to follow Rick's story after Lincoln's departure. The Walking Dead is produced by AMC Studios within the state of Georgia, with most filming taking place in the large outdoor spaces of Riverwood Studios near Senoia, Georgia. The series was adapted from the comic by Frank Darabont, who also served as the showrunner for the first season. However, conflicts between Darabont and AMC forced his departure from the series, and which is currently subject to multiple lawsuits by Darabont and others. Following Darabont, Glen Mazzara, Scott M. Gimple, and Angela Kang have all served as showrunners. Beginning with its third season, The Walking Dead has attracted the most 18- to 49-year-old viewers of any cable or broadcast television series, though viewership has declined in later seasons. The series has been well received by critics, although reception has become more mixed as the series has progressed. It has been nominated for several awards, including the Writers Guild of America Award for New Series and the Golden Globe Award for Best Television Series – Drama. The Walking Dead takes place after the onset of a worldwide zombie apocalypse. The zombies, colloquially referred to as "walkers", shamble towards living humans and other creatures to eat them; they are attracted to noise, such as gunshots, and to different scents, e.g. humans. Although it initially seems that only humans that are bitten or scratched by walkers can turn into other walkers, it is revealed early in the series that all living humans carry the pathogen responsible for the mutation. The mutation is activated after the death of the pathogen's host, and the only way to permanently kill a walker is to damage its brain or destroy the body, such as by cremating it. The series centers on sheriff's deputy Rick Grimes, who wakes up from a coma to discover this apocalypse. He becomes the leader of a group of survivors from the Atlanta, Georgia, region as they attempt to sustain and protect themselves not only against attacks by walkers but by other groups of survivors willing to use any means necessary to stay alive. Sheriff's deputy Rick Grimes wakes from a coma discovering a world overrun by zombies. After befriending Morgan Jones, Rick travels alone to Atlanta to find his wife Lori, his son, Carl, and his police partner and best friend, Shane Walsh, encountering other survivors. The group travels to the Centers for Disease Control (CDC), but find from the sole remaining CDC member that no cure exists for the epidemic. Traveling from Atlanta, Rick's group takes shelter at Hershel Greene's farm while they search for Carol's missing daughter, Sophia. Tension between Rick's group and Hershel's family worsens after it is discovered that Hershel has kept friends and family turned into zombies, including Sophia, in his barn. Rick learns that Shane and Lori had a romantic relationship at the outset of the apocalypse, and Shane and Rick's friendship becomes increasingly unhinged when Lori reveals that she is pregnant. Rick is eventually forced to kill Shane in self-defense. Carl then shoots Shane in the head after he reanimates. The noise draws zombies, forcing Rick's group and Hershel's surviving family to evacuate the farm. Eight months after fleeing Hershel's farm, Rick's group finds a prison, which they clear of zombies to make their new home. Lori dies in childbirth, and Rick becomes withdrawn. Meanwhile, Andrea is rescued by Michonne and the two discover Woodbury, a fortified town led by a man known as the Governor. He learns of Rick's group at the prison, leading to conflict between them. Rick's group eventually raids and destroys Woodbury, but the Governor ultimately has Andrea killed and escapes. Woodbury's citizens live with Rick's group at the prison. Several months after the Governor's attack, a deadly flu kills many of the people at the prison. The Governor finds his former right-hand men and kills them, taking over their group and destroys the prison. Rick's group are forced to separate and flee, but not before Hershel and the Governor are killed. The survivors divide, face their own trials and meet new faces before finding signs pointing to a safe haven called Terminus. One by one, they reunite at Terminus, but all the group are captured for some unknown purpose. Rick discovers the residents of Terminus engage in cannibalism, but the group manage to destroy Terminus and reunite. Some are injured and kidnapped to Grady, a hospital run by corrupt cops and doctors. When the remaining survivors regroup, they are approached by Aaron, inviting them to join a fortified community called Alexandria. They are initially welcomed, but Rick's group realize the residents have not faced the zombie threat directly. Morgan, who has been searching for Rick, arrives and is shocked to see Rick killing an Alexandrian, who has been abusing his wife, in anger. The residents of Alexandria put more trust in Rick's group to protect the town better. A group known as the Wolves use a zombie horde to attack Alexandria, and many lives are lost before the living regain control. While recovering, they learn of a community called the Hilltop, who offer to help trade supplies if they can end the threat of the extortionist Saviors led by a man named Negan. Although Rick's group decimate one Savior outpost, they are later caught by Negan, and forced to swear loyalty to him. Negan brutally murders Glenn and Abraham, and confiscates all of the Alexandrians' guns, along with a substantial amount of their goods. His actions initially lead Rick to submit. Later, Michonne persuades Rick to fight back, and they recruit a community called the Scavengers to help. Meanwhile, Rosita and Eugene make a bullet for the purpose of killing Negan. When their attempt fails (the bullet is blocked by Lucille, Negan's baseball bat), Negan forcibly recruits Eugene as a Savior. Separately, Carol and Morgan befriend King Ezekiel, the leader of another community, while Maggie and Sasha rally the Hilltop. Negan, the Saviors, and the turncoat Scavengers attack Alexandria, but are repelled by Sasha's sacrifice and the aid of Kingdom and Hilltop soldiers. Rick, Maggie, and Ezekiel rally their communities into war against Negan and the Saviors. Losses are heavy on both sides. Many of the Kingdom's soldiers are killed, Alexandria falls to a Savior attack, and Carl is bitten by a walker. Before euthanizing himself, Carl convinces Rick to end the war and restart society anew. Negan attempts to wipe out Rick and his allies in a final battle, but Eugene thwarts his plan by sabotaging the Saviors' bullets. Negan is then wounded and captured by Rick. Against Maggie's wishes, Negan is spared and imprisoned, ending the war. The first half of the season talks place about a year and a half after Negan's defeat. Rick suggests building a bridge to help with movement between the communities, but this ultimately leads to more resentment between them. While trying to lead a horde of walkers away from the construction camp, Rick is seemingly killed while blowing up the bridge, but in actuality is found by Jadis and taken to parts unknown by helicopter. Six years later, the apparent death of Rick has left some discourse between the communities, but they find themselves up against a new common threat in the form of masked Whisperers and their leader Alpha, who feel the communities are weak and demands they do not trespass on her lands. In February 2019, the series was renewed for a tenth season which is expected to premiere in October 2019. Danai Gurira, who has starred as Michonne since the third season, stated that she has signed on for only a recurring role in the tenth season, which will also serve as her final season in the series; however, she will likely join Andrew Lincoln in the three follow-up films. Executive producer David Alpert said in 2014 that the original comics have given them enough ideas for Rick Grimes and company over the next seven years. "I happen to love working from source material, specifically because we have a pretty good idea of what season 10 is gonna be", Alpert said. "We know where seasons 11 and 12 [will be]... we have benchmarks and milestones for those seasons if we're lucky enough to get there." In September 2018, AMC CEO Josh Sapan stated that they plan on continuing The Walking Dead franchise for another 10 years, including new films and television series based on the original comic book series. The list below contains those that have been credited within the series' title sequence and those who are credited as "also starring". Recurring and guest stars are listed on the individual season pages. The series features several actors whom Walking Dead developer Frank Darabont has worked with previously, including Laurie Holden (Andrea), Jeffrey DeMunn (Dale Horvath), Melissa McBride (Carol Peletier), Sam Witwer (the dead soldier in the tank where Rick hides in "Days Gone Bye"), and Juan Pareja (Morales). All five appeared in his 2007 film The Mist, along with Thomas Jane, who originally was set to star in the series when it was pitched to HBO. Jane was later in talks with Darabont to possibly guest star on the series as of fall 2010, but with Darabont's departure, it is unknown whether the guest spot will happen or not. Laurie Holden also appeared in the 2001 film The Majestic (as Adele Stanton, Jim Carrey's character's love interest), which Darabont directed. DeMunn has also appeared in several of Darabont's films; in addition to The Mist and The Majestic, he appeared in The Shawshank Redemption (1994) and The Green Mile (1999). It was planned that Witwer (Private Jessup in Darabont's The Mist) would reprise his "Days Gone Bye" role in the original conception of The Walking Dead's second-season premiere and in a webisode, but both plans were discarded. On January 20, 2010, AMC officially announced that it had ordered a pilot for a possible series adapted from The Walking Dead comic book series, with Frank Darabont and Gale Anne Hurd acting as executive producers and Darabont writing and directing. The entire series was pre-ordered based just on the strength of the source material, the television scripts, and Darabont's involvement. In January 2010 a review of the pilot episode's script attracted further attention. The pilot began filming in Atlanta, Georgia on May 15, 2010 after AMC had officially ordered a six-episode first season. The series' remaining episodes began filming on June 2, 2010 with Darabont serving as showrunner. On August 31, 2010, Darabont reported that The Walking Dead had been picked up for a second season, with production to begin in February 2011. On November 8, 2010, AMC confirmed that there would be a second season consisting of 13 episodes. He would also like to include some of the "environmental elements" that take place during Volume 2 of Kirkman's book. The first season writing staff consisted of series developer and executive producer Frank Darabont (who wrote/co-wrote four of the six episodes), executive producer Charles H. Eglee, executive producer and creator of the comic book Robert Kirkman, co-executive producer Jack LoGiudice, consulting producer Adam Fierro and Glen Mazzara, all of whom contributed to one episode each. Along with Darabont, who directed the pilot episode, the remaining five were directed by Michelle MacLaren, Gwyneth Horder-Payton, Johan Renck, Ernest Dickerson, and Guy Ferland, respectively. On December 1, 2010, Deadline Hollywood reported that Darabont had fired his writing staff, including executive producer Charles "Chic" Eglee, and planned to use freelance writers for the second season. 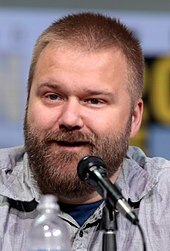 Kirkman called the announcement "premature" and clarified that Eglee left to pursue other projects when Darabont decided to stay on as showrunner, and no definitive plans had been made regarding the writing staff for the second season. [Chic Eglee] was brought onto The Walking Dead with the idea that Frank was going to work on the first season and then go off and do movies [...] Chic didn't want to be second-in-command on a show when he's used to being a top dog, and so he decided to go off and do something else, which is something that happens and is not a big deal. After the departure of Frank Darabont, the role of showrunner was assumed by Glen Mazzara (left) for the second and third seasons, Scott M. Gimple (middle) from the fourth to the eighth season, and Angela Kang (right) for the ninth season. On December 3, 2010, in an interview with Entertainment Weekly, executive producer Gale Anne Hurd commented: "It's completely inaccurate. [In] the writers' room, there are people that have set up other projects that will be their first priority if their own series is picked up as a pilot or if it's a series. I think [Eglee] just decided that he wants to run his own show." She revealed that it would be likely for the series to return in October 2011, as Darabont and Kirkman planned on mapping out the next season early in 2011. She also confirmed that, "every one of the principal cast is signed up for multiple seasons." In July 2011, series developer and showrunner Frank Darabont stepped down from his position as showrunner for the series, over unclear circumstances (see Lawsuits below). Executive producer Glen Mazzara was appointed the new showrunner in Darabont's place. New writers joined the writing staff in the second season, including co-executive producer Evan Reilly, producer Scott M. Gimple, story editor Angela Kang, and David Leslie Johnson. New writers in the third season included producers Nichole Beattie and Sang Kyu Kim, with Frank Renzulli contributing a freelance script. After the conclusion of the third season, Glen Mazzara stepped down from his position as showrunner and executive producer for the series, per a mutual agreement between Mazzara and AMC. The press release read, "Both parties acknowledge that there is a difference of opinion about where the show should go moving forward, and conclude that it is best to part ways." Scott M. Gimple succeeded Mazzara as showrunner for the fourth season, with new writers joining the writing staff, such as Curtis Gwinn, Channing Powell, and Matt Negrete. In January 2018, it was announced that Gimple would be promoted to the newly created position of Chief Content Officer of the entire Walking Dead franchise, and that Angela Kang would replace him as showrunner beginning with the ninth season. The television series generally tends to follow Kirkman's comic series across major characters and plots; for instance, events of the premiere episode of the seventh season correlate to events in issue #100 of the comics. The series does not attempt to go step-by-step with the comics, and has leeway in the narrative. In particular, the series' writers, along with Kirkman, often "transfer" how a character has died in the comics to a different character in the series. For example, in the fourth season, where Hershel Greene is beheaded by the Governor in the standoff with Rick's group at the prison; in the comic, Tyreese is the one who suffers this fate. Some of the television characters, like Carol, have far outlived their comic counterparts, while others that have already been killed off, like Sophia and Andrea, remained alive for some time in the ongoing comic series. In addition, the writers have included characters wholly novel to the series such as Daryl Dixon, which producer Gale Anne Hurd says helps to create a new dynamic for the series, and keeps the audience guessing from what had already been established in the comic series. The Walking Dead has featured a large rotating ensemble cast. In most cases, because of the nature of the show, departure of actors from the show are determined by the writing, with characters either killed off or written off the show as necessary to develop the story. Cast members are generally told ahead of time if they have been written off the show, but otherwise kept to secrecy. For example, Steven Yeun, who played Glenn Rhee since the pilot through the season seven premiere, knew of his character's death for a year but had to keep quiet, while Chandler Riggs, playing Carl Grimes through the eighth season, was told of his character's departure during the filming in the weeks leading into his final episodes. Andrew Lincoln had played the series' protagonist Rick Grimes since the pilot. Lincoln announced his plan to leave the show at the start of the ninth season, finding that having to spend half a year in the United States for film left him missing out on his family in the United Kingdom. Lincoln completed six episodes in the season to close out Rick's storyline within the series, which will be continued in three made-for-television films. Lauren Cohan had played Maggie Greene since the second season. As contract negotiations began for the ninth season, Cohan had been given the opportunity to star in Whiskey Cavalier, limiting how much time she would be able to give to the show. Cohan played out Maggie for the first six episodes of the season, but has not ruled out returning if the opportunity is presented. Danai Gurira who has played Michonne since the third season, announced that she will be leaving the show after the tenth series, participating in a handful of episodes balanced against her other acting commitments. Both Lennie James (as Morgan Jones) and Austin Amelio (as Dwight) were transferred from the main series to the spin-off series Fear the Walking Dead. Casting salaries for the principle actors have grown significantly over the course of the show, up through the seventh season. Overall, the salaries had been lower compared to other similar dramas, including AMC's own Mad Men, but this was justified due to the volatility of any character being potentially written off the show. Norman Reedus and Melissa McBride, playing Daryl Dixon and Carol Peletier respectively, had made around US$9,500 per episode during the first season, and by the seventh season, had gotten up to US$80,000 per episode. Lincoln himself was only earning US$90,000 per episode in the seventh season. By season nine, with the departure of Lincoln, Reedus had repeated secured a US$350,000 per episode pay plus additional incentives, potentially earning him US$50-90 million over three seasons. McBride similarly had gotten a extended contract in season nine worth US$20 million over three seasons. Both of these were intended to secure the pair as central figures for the show going forward in Lincoln's absence. 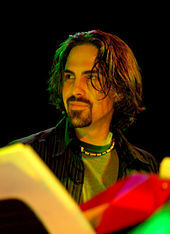 Bear McCreary was hired to compose the score for the series. McCreary stated that the main theme was based on his viewing of production designs for the opening title sequence. Instead of doing a full theme song as with his earlier works, McCreary chose to use a simple, repeating motif from the strings section. It repeats over and over, and in fact in the pilot episode, you start hearing it before the main title begins, and this is something that continues episode to episode. You hear the main title music before the main title begins, so you know it's coming. That, to me, was the little hook – that little thing that, whenever you hear it, it takes you to the series. Four soundtracks for The Walking Dead have been released to date. The Walking Dead: AMC Original Soundtrack, Vol. 1 was released on March 17, 2013. The second volume was released on March 25, 2014. Songs of Survival is a soundtrack for the third season and it was released on August 27, 2013, by Republic Records as a Walmart exclusive for the special edition release of the third season. Songs of Survival, Vol. 2 is a soundtrack for the fourth season and it was released on August 26, 2014, by Republic Records as a Walmart exclusive of the fourth season release. Greg Nicotero is an executive producer and the key special effects makeup artist on the series. Each walker is put through "zombie school" and is taught how to move like zombies. There are three levels of zombie makeup: Hero, Midground, and Deep Background. Hero zombies are featured walkers and are completely made over from head to toe. Midground zombies get highlights and shadows on the face, but do not get close enough to the camera to require full makeup. Deep background zombies often wear masks and are only meant to be used as a backdrop. The Walking Dead is mostly filmed in Georgia. Since 2002, the state has offered a tax incentive for large film productions to drive producers to the state and bolster its economy. The first season was filmed primary in Atlanta, though required a great deal of coordination with the city to shut down streets and parks for film. Production for subsequent seasons moved mainly to Riverwood Studios (doing business as Raleigh Studios Atlanta), a plot of land approximately 120 acres (0.49 km2) outside of Senoia, Georgia. Some existing buildings were used here, such as a subdivision that is used by several families that serves as the Alexandria Safe-Zone, while other buildings are constructed as sets, such as the exterior shots of the main Hilltop mansion, the trash heaps used by the Scavengers, or Father Gabriel's church. Sets are torn down when no longer needed; the church, after its use in the fifth season, was removed and its spot used for the iconic setting for the first meeting between Rick's group and Negan in the seventh season. The property includes sound stages constructed for interior shots, which then may be reused; the interior sets for the prison during the third season were reused to serve as the buildings and sets for the Savior's Sanctuary in the seventh season. In July 2017, AMC purchased the studio lot from Riverwood for $8.25 million. Some scenes are shot outside of the studio. 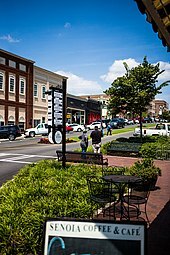 Woodbury, during the third season, was filmed in downtown Senoia. Other exceptions include the Kingdom, which is filmed at the former military base Fort McPherson, now converted to studios for Tyler Perry. The series is completely shot on 16 mm film. David Tattersall was the director of photography for the pilot episode with David Boyd as the director of photography on the remainder of the episodes. Production design is done by Greg Melton and Alex Hajdu. The effects team includes veteran special effects makeup designers Greg Nicotero and Toby Sells, special effects coordinator Darrell Pritchett, and visual effects supervisors Sam Nicholson and Jason Sperling. The Walking Dead debuted during the same week in 120 countries. As part of an expansive campaign to advertise and heighten anticipation for the premiere, AMC and Fox International Channels coordinated a worldwide zombie invasion event on October 26, 2010. The stunt involved invading 26 major cities within a 24-hour period, starting with Taipei and Hong Kong, and ending in Los Angeles for the U.S. premiere. The series' official website released, just prior to the San Diego Comic-Con in 2010, a motion comic based on Issue No. 1 of the original comic and voiced by Phil LaMarr. The site also posted a making-of documentary primarily about the first episode, as well as a number of other behind-the-scenes videos and interviews. In the documentary, comic series creator and television series executive producer Robert Kirkman, as well as artist Charlie Adlard, say they are pleased with how faithful the series is to the comic and remark on the similarities between the actors and the comic's original character drawings. Action figures of characters from the series were created for release in November 2011 and have continued throughout the years with eight line-ups. The figures, which are manufactured by McFarlane Toys, are designed to resemble the actors on the series. Figures created to resemble the characters as drawn in the comic book were released in September 2011. With a primary objective of reducing the environmental impacts of film and television productions, including The Walking Dead, producer Gale Anne Hurd has directed the cast, crew, production team, suppliers, and bloggers about her series to adopt the Doddle app to make the production almost paper-free; this works by digitally transmitting interactive call sheets and other intra-team and team-supplier communications (such as directions, images, menus, and updates) to people's cell phones and tablets. Hurd said of using Doddle: in addition to conserving paper, "It's also easier, and it's better for security. People are less likely to leave their smartphone or tablet lying around for someone else to pick up." Hurd describes additional steps taken to increase efficiency and cut production costs: "If you use vehicles that get better gas mileage, that are electric or hybrids, you're going to pay a lot less in fuel. If you use compact fluorescent bulbs, you're going to save a lot of money in utilities. If you recycle even your own sets, and use them again, that's going to save money. You don't have to buy new lumber. So there are cost savings, absolutely." Additionally, the production team aims to reduce vehicle idling, which decreases carbon dioxide emissions. Hurd also cuts down on plastic waste by personally using a refillable, stainless steel EcoUsable water bottle and promoting its use among her colleagues. She shared: "on a lot of my projects I give them as crew gifts before we start production, and have water stations available, but you can't force people to use them." To date, four web series based on The Walking Dead have been released via AMC's website–Torn Apart (2011), Cold Storage (2012), The Oath (2013) and Red Machete (2017). In 2011, AMC debuted an animated comic book version of The Walking Dead novel's beginning, featuring the voice of actor Phil LaMarr. A live television aftershow titled Talking Dead premiered on AMC on October 16, 2011, following the encore presentation of The Walking Dead's second-season premiere. Talking Dead features host Chris Hardwick discussing the latest episode with fans, actors, and producers of The Walking Dead. Following the departure of Andrew Lincoln as Rick Grimes during the ninth season, chief content officer Scott Gimple stated that they plan to create three AMC Original Films to explore events related to Rick's character in the future, starring Lincoln, and with the first expected to begin production in 2019. Besides Lincoln, Pollyanna McIntosh (Jadis / Anne) will also star in these films. Gimple stated that these will not simply be extended episodes, nor will attempt to adapt any of the comic stories, but will heavily involve Kirkman in their development. Fear the Walking Dead is a companion series to The Walking Dead, developed by AMC. AMC started development of the series around September 2013 and committed to a two-season broadcast by March 2015. Fear the Walking Dead was first broadcast on August 23, 2015. Fear the Walking Dead features a different set of characters, developed by Kirkman. The series starts at the onset of the zombie apocalypse, and follows several people that escape Los Angeles as the military attempts to quarantine the city, and seek refuge along the west coast of the United States and Mexico. The fourth season of Fear the Walking Dead features a crossover with The Walking Dead, specifically through the character Morgan Jones (played by Lennie James) who joins the cast of Fear the Walking Dead after the events of the eighth season of The Walking Dead. Similarly, Dwight, played by Austin Amelio, is slated to join Fear the Walking Dead for its fifth season in 2019. AMC's COO Ed Carroll affirmed during the network's investors conference call in February 2019 that the network is currently developing a second spin-off series for The Walking Dead. AMC officially announced it had ordered a 10-episode series, created by Gimple and Negrete, in April 2019 with plans to broadcast in 2020. The series would focus on the first generation of children that have grown up during the zombie apocalypse, taking place within Virginia, and will feature two female leads. Due to its popularity, The Walking Dead has inspired dozens of parodies and spoofs featured on YouTube channels like Bad Lip Reading and television series such as Saturday Night Live and Mad TV. Bad Lip Reading made a widely viewed parody involving Rick and the Governor, entitled "La-Bibbida-Bibba-Dum". The series' cast was shown the parody at the San Diego Comic-Con in 2013, and David Morrissey—who portrays the Governor— reacted by saying he now understood why so many people would walk up to him on the street and blurt, "Hey, La-Bibbida-Bibba-Dum!". Until seeing the video, he had wondered, "what's wrong with these people?" The Walking Dead has also been represented as a live comedy performance by English comedian Dan Willis at the Edinburgh Festival. Scenes from the pilot were screened July 23, 2010, as part of the San Diego Comic-Con in 2010. It premiered on AMC on October 31, 2010, and premiered internationally on Fox International Channels during the first week of November. Almost two weeks before the official premiere on AMC, the pilot episode leaked online. International broadcast rights for the series were sold and announced on June 14, 2010. The series airs on Fox International Channels in 126 countries in 33 languages. The fifth season debuted its first part on October 13, 2014. The second part premiered on February 9, 2015. The first season DVD and Blu-ray was released on March 8, 2011. A three-disc special edition of the first season—featuring new featurettes and audio commentaries—was released on DVD and Blu-ray on October 4, 2011. The European versions of the first season DVD and Blu-ray are edited for gore, with cuts to episode two ("Guts"), episode three ("Tell It to the Frogs"), episode four ("Vatos") and episode five ("Wildfire"). Until eOne/WVG re-released the first season in D-A-CH in a Special Uncut Version on DVD and Blu-ray on May 31, 2013. The second season DVD and Blu-ray was released on August 28, 2012. It was also released as a limited edition Blu-ray, packaged as a miniature zombie head designed by McFarlane Toys. Special features include audio commentaries, deleted scenes, webisodes, and several featurettes. The third season DVD and Blu-ray was released on August 27, 2013. It was also released as a limited edition Blu-ray, packaged as a miniature version of the Governor's zombie head aquarium tank designed by Greg Nicotero and sculpted by McFarlane Toys. Special features include audio commentaries, deleted scenes, and several featurettes. The fourth season DVD and Blu-ray was released on August 26, 2014. It was also released as a limited edition Blu-ray, packaged with a tree-walker designed by McFarlane Toys. Special features include audio commentaries, deleted scenes, and several featurettes, as well as extended episodes which are exclusive to the Blu-ray. The fifth season was released on August 25, 2015, the sixth season on August 23, 2016, the seventh season on August 22, 2017, and the eighth season on August 21, 2018. Home video release for the first six seasons was distributed by Anchor Bay Entertainment, and home video release for the seventh season onwards was distributed by Lionsgate Home Entertainment in the United States for the American home video releases. The international home video release were distributed by Entertainment One. MyNetworkTV acquired the broadcast syndication rights to the series, premiering on October 1, 2014. The version that airs on MyNetworkTV is edited to meet broadcast television standards. The first six seasons and the ninth season of The Walking Dead have been well reviewed by recognized critics, while the seventh and eighth seasons received more mixed reviews. The series has a 80% approval rating to date on Rotten Tomatoes. For the first season, 88% of 28 Rotten Tomatoes critics gave it a positive review, with an average score of 7.53/10. That site's consensus states, "Blood-spattered, emotionally resonant, and white-knuckle intense, The Walking Dead puts an intelligent spin on the overcrowded zombie subgenre." Metacritic scored the first season 82/100 based on 25 critic reviews, 23 of which were positive, two mixed, and none negative. Heather Havrilesky of Salon.com included the series on their list of 9 new television series not to miss, giving it a grade of "A", with the author saying, "A film-quality drama series about zombies? Somebody pinch me!" For the second season, 81% of 24 critic reviews on Rotten Tomatoes were positive, with an average score of 8.09/10. The site's consensus states, "The second season of The Walking Dead fleshes out the characters while maintaining the grueling tension and gore that made the show a hit." Of 22 Metacritic critic reviews, 18 were positive, four were mixed, and none were negative; their average score was 80/100. Early criticism of the series focused on the slow pace of the second season, particularly the first half. Ken Tucker of Entertainment Weekly, described the series as "a nighttime soap", comparing it to "a parody of a Samuel Beckett play" that had very little sense of direction and few appearances of walkers. Nate Rawlings of Time's online entertainment section noted that "the pace during the first half of this season has been brutally slow. [...] They've tried to develop individual characters, but each subplot meant to add a layer to a character has been quickly resolved." Later reviews from other critics, such as Scott Wampler of Collider.com, recognized the increased quality of the second half, stating it "seemed far more intense, more interesting, better written". Recognizing the overall season, Kevin Yeoman of Screen Rant offered praise saying "the writers succeeded in unshackling themselves from the intermittent monotony brought about by the serial nature of the show". The third season had 88% of Rotten Tomatoes' 33 critics giving it a positive review, with an average score of 7.96/10. The site's consensus states, "The palpable terror and visceral thrills continue in the third season of The Walking Dead, along with a deeper sense of the people who inhabit its apocalyptic landscape." Metacritic's 19 critics rated the season 82/100, all of whom gave a positive review. Verne Gay of Newsday claimed that the third-season premiere "does not disappoint" going on to say that there are "spots where you will yell out at the screen, 'Oh, my God, that just didn't happen.' Yes, the new season is that good", concluding his review by giving the season an A+ rating. For the fourth season, 83% of Rotten Tomatoes' 31 critic reviews were positive, with an average score of 7.66/10. The site's consensus states, "Consistently thrilling, with solid character development and enough gore to please grindhouse fans, this season of The Walking Dead continues to demonstrate why it's one of the best horror shows on television". Metacritic scored the season 75/100 based on 16 critic reviews, 13 of which were positive, three mixed, and none negative. The fifth season had 89% of Rotten Tomatoes' 31 critic reviews rating it positively, with an average score of 7.87/10. The site's consensus states, "Thanks to a liberal dose of propulsive, bloody action and enough compelling character moments to reward longtime fans, The Walking Dead's fifth season continues to deliver top-notch entertainment." Metacritic scored the fifth season 80/100 based on 11 critic reviews, all of which were positive. For the sixth season, 77% of Rotten Tomatoes' 23 critic reviews were positive, with an average score of 7.35/10. The site's consensus states, "Six seasons in, The Walking Dead is still finding ways to top itself, despite slow patches that do little to advance the plot." Metacritic scored the sixth season 79/100 based on 10 critic reviews, nine of which were positive, one mixed, and none negative. For the seventh season, 63% of Rotten Tomatoes' 12 critic reviews rated it positively, with an average score of 6.97/10. The site's consensus is, "Increased character depth and effective world-building helps The Walking Dead overcome a tiresome reliance on excessive, gratuitous violence." For the eighth season, 64% of Rotten Tomatoes' 16 critic reviews rated it positively, with an average score of 6.68/10. The site's consensus states "The Walking Dead's eighth season energizes its characters with some much-needed angst and action, though it's still occasionally choppy and lacking forward-moving plot progression." For the ninth season, 90% of Rotten Tomatoes' 18 critic reviews were positive, with an average score of 7.23/10. The site's consensus states, "Nine seasons in, The Walking Dead feels more alive than ever, with heightened tension and a refreshed pace that rejuvenates this long-running franchise." Metacritic scored the ninth season 72/100 based on 4 critic reviews, 3 of which were positive, one mixed, and none negative. The Walking Dead has the highest total viewership of any series in cable television history, including its third through sixth seasons, during which it averaged the most 18- to 49-year-old viewers of all cable or broadcast television series. Total viewership for its fifth-season premiere was 17.3 million, the most-watched series episode in cable history. In 2016, a New York Times study of the 50 television series with the most Facebook Likes found that like most other zombie series, The Walking Dead "is most popular in rural areas, particularly southern Texas and eastern Kentucky". The Walking Dead was nominated for Best New Series by the Writers Guild of America Awards 2011 and Best Television Series Drama by the 68th Golden Globe Awards. The series was named one of the top 10 television programs of 2010 by the American Film Institute Awards 2010. For the 37th Saturn Awards, the series received six nominations—for Best Television Presentation, Andrew Lincoln for Best Actor in Television, Sarah Wayne Callies for Best Actress on Television, Steven Yeun for Best Supporting Actor in Television, Laurie Holden for Best Supporting Actress in Television, and Noah Emmerich for Best Guest Starring Role in Television. The series was nominated for Best Drama Series by the inaugural 1st Critics' Choice Television Awards. The pilot episode "Days Gone Bye" received three nominations from the 63rd Primetime Emmy Awards—for Outstanding Sound Editing for a Series and Outstanding Special Visual Effects for a Series and won for Outstanding Prosthetic Makeup for a Series, Miniseries, Movie, or Special. For the 41st Saturn Awards, the series received its highest number of nominations, with a total of seven, including for the series itself, Andrew Lincoln for Best Actor on Television, Norman Reedus for Best Supporting Actor on Television, Emily Kinney and Melissa McBride for Best Supporting Actress on Television, Andrew J. West for Best Guest Star on Television, and Chandler Riggs for Best Young Performer on Television. Darabont's departure as showrunner in July 2011 during the second season came as surprise to many, as it came shortly after the season's premiere and a few days after that year's Comic-Con, where Darabont helped to promote the series. It was speculated that he was unable to adjust to the schedule of running a television series; however, The Hollywood Reporter reported that AMC had fired him. There had been reported difficulties in the production of the second season, including disputes over planned budget cuts and executive meddling, and it was known that Darabont and AMC had several discussions relating to these factors. Neither Darabont, AMC, nor the cast nor crew of The Walking Dead spoke about the reasons for his firing. In December 2013, Darabont and his agents from Creative Artists Agency (CAA) filed a lawsuit against AMC in a New York court, citing breach of contract. A central part of Darabont's lawsuit accuses AMC of denying him and the CAA the promised profits from the success of the series, based on how AMC had used vertical integration in producing and distributing The Walking Dead. As stated in Darabont's filing, he had initially entered into a contract with AMC to have a third-party studio produce the series, from which he would have obtained 12.5% of that entity's profits, after standard deductions. AMC wanted to produce the series in-house, and for the first season, Darabont's lawyers had been assured that Darabont would be protected from self-dealing fees by having AMC commit to imputed license fees equivalent to those of other independent studios, with Darabont earning profit from that. Darabont's suit contends that when the series' popularity took off, AMC presented a license fee deal to Darabont around February 2011 that used "an unconscionably low license fee formula" such that AMC could report the series running at a loss and ensuring that Darabont would never see any profit from the series; as an example, the suit references statements in 2012, following the second season, that AMC claimed the series was running at a $49 million deficit, despite being one of the most popular series in broadcast. Darabont's suit contends he was fired just at the start of the second season so that AMC would avoid having to pay him. Initial discovery phase hearings were held in 2014. Darabont's lawyers sought to gain information from AMC on their other series, specifically Breaking Bad and Mad Men, to obtain a "fair market value" for The Walking Dead. AMC asserted it had done no wrongdoing, had already paid Darabont $3 million upfront for two seasons, and was able to properly set the imputed license fee that worked into the profit formula for Darabont. The network resisted the request to provide otherwise confidential information on the other series. The court granted Darabont's lawyers access to the requested information as part of the discovery phase. Darabont described "crisis-level problems" during the series' production while under deposition, claiming that AMC had cut the per-episode budget from $3.4 million to $3 million while keeping the tax credit offered by the state of Georgia for filming there, effectively reducing the production budget by 25%. In August 2015, Darabont requested to amend his original complaint that AMC further reduced his profits from the second season as his firing mid-season meant he was not fully vested in the season, allowing AMC to reduce the profits paid him. Darabont's amended request points out that he had written and produced all the episodes in that season already and was entitled to the proper profit share. The judge granted this amendment in February 2016, partially influenced by concerns raised in Darabont's deposition. At the end of the discovery phase in September 2016, Darabont's lawyers stated they are seeking damages of over $280 million; AMC stated they will "vigorously" defend against the lawsuit. Summary judgement statements were completed in July 2017. While waiting for summary judgement, Darabont and the CAA filed a second lawsuit against AMC, based on further evaluation of material from the discovery phase. The second suit contended that AMC purposely manipulated some of its licensing fees that should go to Darabont, such as revenue from digital sales and from overseas markets. Though AMC had initially refused to provide necessary documents for discovery for this new case, AMC did offer to willingly provide them after Darabont's attorneys threatened further legal action during October 2018. By December 2018, the presiding judge ruled against issuing summary judgement in the case, setting up for a jury trial to hear the full case. Due to the retirement of the judge that had overseen the previous cases, a new judge was assigned to the case in February 2019, who joined both the initial 2013 suit and the 2018 suit into a single case, expected to be heard in May 2020. In August 2017, Robert Kirkman, Gale Anne Hurd, Charles Eglee, Glen Mazzara and David Alpert filed similar lawsuits against AMC, citing breach of contract over profits owed to them as a result of AMC's vertical integration. As with Darabont, each had been given a certain percentage of the series' profits based on if the series was produced by a third-party, but when it was transitioned to AMC Studios, their share was dramatically reduced. The Hollywood Reporter estimated that if the four seek similar damages as Darabont, the lawsuit could be as high as $1 billion. The suits, filed separately in Los Angeles and New York City, will be consolidated into a single case to be heard in a California court. Kirkman and the others said that despite the lawsuit, they will continue to work as "partners" with AMC to assure continued success of The Walking Dead and its spinoff series Fear the Walking Dead. ^ Seibert, Perry. "The Walking Dead [TV Series]". AllMovie. Archived from the original on April 29, 2014. Retrieved March 4, 2014. ^ Stelter, Brian (November 14, 2010). "At AMC, Two Character Dramas Just One Hit". The New York Times. Archived from the original on April 10, 2014. Retrieved December 28, 2013. ^ a b "The Walking Dead". Rotten Tomatoes. Archived from the original on August 22, 2015. Retrieved August 20, 2015. ^ a b "AMC Garners Six WGA Award Nominations for Acclaimed Original Dramas "Mad Men," "Breaking Bad" and "The Walking Dead"" (Press release). AMC. December 8, 2010. Retrieved December 9, 2010. ^ a b Reiher, Andrea (December 14, 2010). "2011 Golden Globes nominations: 'Glee,' '30 Rock' lead TV nominations". Zap2it. Archived from the original on December 17, 2010. Retrieved December 14, 2010. ^ "The Walking Dead – Season 1 Recap". AMC. Archived from the original on July 6, 2015. Retrieved July 8, 2015. ^ Maurer, Mark (October 14, 2011). "'The Walking Dead': What you need to know about Season 1". The Star-Ledger. NJ.com. Archived from the original on July 9, 2015. Retrieved July 8, 2015. ^ "The Walking Dead – Season 2 Recap". AMC. Archived from the original on July 10, 2015. Retrieved July 9, 2015. ^ "The Walking Dead – Season 3 Recap". AMC. Archived from the original on July 10, 2015. Retrieved July 9, 2015. ^ "The Walking Dead – Season 4 Recap". AMC. Archived from the original on July 10, 2015. Retrieved July 9, 2015. ^ "The Walking Dead – Season 5 Recap". AMC. Archived from the original on July 10, 2015. Retrieved July 9, 2015. ^ Lussier, Germain (February 4, 2019). "The Walking Dead Shambles Into a Season 10 Renewal". io9. Retrieved February 4, 2019. ^ Barett, Brian (February 8, 2019). "'Walking Dead' Shocker: Danai Gurira to Exit". The Hollywood Reporter. Retrieved February 8, 2019. ^ Melrose, Kevin (June 10, 2014). "'The Walking Dead' producers hope to keep the show alive through Season 12". HitFix. Archived from the original on June 15, 2014. Retrieved June 13, 2014. ^ Shaw, Lucas (September 19, 2018). "Inside AMC Networks' Plan to Make 'Walking Dead' Live Forever". Bloomberg. Retrieved October 8, 2018. ^ a b c Wigler, Josh (October 6, 2018). "'Walking Dead': Andrew Lincoln Delivers Emotional Goodbye to Fans at New York Comic-Con". The Hollywood Reporter. Retrieved October 6, 2018. ^ a b c d Goldberg, Lesley (July 7, 2016). "'Walking Dead' Promotes 4 to Series Regular for Season 7 (Exclusive)". The Hollywood Reporter. Archived from the original on July 8, 2016. Retrieved July 7, 2016. ^ a b c Goldberg, Lesley (April 17, 2017). "'Walking Dead' Promotes Trio to Series Regular for Season 8". The Hollywood Reporter. Retrieved May 4, 2017. ^ a b Mason, Charlie (May 7, 2018). "The Walking Dead Promotes Two Actors to Series Regulars Ahead of Season 9". TVLine. Retrieved May 7, 2018. ^ Alexander, Bryan (September 20, 2010). "Thomas Jane Yearns To Be One of 'The Walking Dead'". NBC Washington. Archived from the original on March 6, 2012. Retrieved December 13, 2010. ^ Molloy, Tim (July 27, 2011). ""Walking Dead" Gets a New Showrunner". Reuters. Archived from the original on January 4, 2014. Retrieved November 23, 2012. ^ Marnell, Blair (January 5, 2012). "Being Human' Star Slams AMC Over Aborted 'Walking Dead' Web Series". Crave Online. Archived from the original on January 10, 2012. Retrieved April 1, 2012. ^ Melrose, Kevin (January 5, 2012). "Being Human Star Reveals Aborted Plans for Walking Dead Web Series". Spinoff Online. Archived from the original on July 23, 2012. Retrieved April 3, 2013. ^ Melrose, Kevin (January 9, 2012). "Darabont Had a Different Opening for The Walking Dead Season 2". Spinoff Online. Archived from the original on May 16, 2012. Retrieved April 3, 2013. ^ Otto, Jeff (July 6, 2010). "'The Walking Dead' Set Visit Preview: The Bloodiest Show Ever!". Bloody Disgusting. Archived from the original on July 9, 2010. Retrieved November 2, 2010. ^ Goldman, Eric (January 20, 2010). "AMC Orders Walking Dead Pilot". TV IGN. Archived from the original on January 24, 2010. Retrieved June 11, 2010. ^ Sauriol, Patrick (January 25, 2010). "Exclusive: A review of the pilot script for The Walking Dead TV series". Corona Coming Attractions. Archived from the original on July 8, 2011. ^ Miska, Brad (February 10, 2010). "TV: 'The Walking Dead' Pilot to Begin Lensing in May". Bloody Disgusting. Archived from the original on October 19, 2011. Retrieved June 7, 2011. ^ Seidman, Robert (March 29, 2010). ""The Walking Dead Lives on AMC;" Network Greenlights Series Based On Comic Books". TV by the Numbers. Archived from the original on October 19, 2012. Retrieved June 11, 2010. ^ Chan, Jon (June 2, 2010). "Walking Dead TV Series Starts Filming!". Secondary Fire. Archived from the original on December 2, 2010. Retrieved June 11, 2010. ^ Barton, Steve (June 14, 2010). "The Walking Dead: Frank Darabont Only Directing the Pilot?". Dread Central. Archived from the original on June 16, 2010. Retrieved June 15, 2010. ^ "AMC Resurrects 'The Walking Dead' for a Second Season" (Press release). AMC. November 8, 2010. Retrieved November 8, 2010. ^ Pirrello, Phil (August 31, 2010). "Want Walking Dead Season 2?". IGN. Archived from the original on September 2, 2010. Retrieved September 1, 2010. ^ "EXCLUSIVE!! Learn Who Writes And Directs All The Season-One Episodes of Frank Darabont's AMC Zombie Series THE WALKING DEAD!!". Ain't It Cool News. July 17, 2010. Archived from the original on July 20, 2010. Retrieved July 18, 2010. ^ Andreeva, Nellie (December 1, 2010). "'The Walking Dead' Lets Go Of Writers; Considers No Writing Staff For Season 2". Deadline Hollywood. Archived from the original on December 3, 2010. Retrieved December 3, 2010. ^ a b Bryant, Adam (December 2, 2010). "The Walking Dead's Robert Kirkman: Writing Staff Changes Won't Affect the Show". TV Guide. Archived from the original on December 3, 2010. Retrieved December 3, 2010. ^ Collis, Clark (December 3, 2010). "'Walking Dead' exclusive: Exec producer Gale Anne Hurd denies Frank Darabont fired writers, talks season two". Entertainment Weekly. Archived from the original on December 5, 2010. Retrieved December 4, 2010. ^ a b Andreeva, Nellie (July 26, 2011). "'WALKING DEAD' SHOCKER: Frank Darabont Steps Down As Showrunner". Deadline Hollywood. Archived from the original on July 28, 2011. Retrieved July 27, 2011. ^ Andreeva, Nellie (July 27, 2011). "Glen Mazzara to Succeed Frank Darabont as 'Walking Dead' Showrunner". Deadline Hollywood. Archived from the original on October 19, 2011. Retrieved July 27, 2011. ^ Harnick, Chris (December 21, 2012). "'The Walking Dead' Season 4: AMC, Glen Mazzara Part Ways For New Season". The Huffington Post. Archived from the original on December 22, 2012. Retrieved December 21, 2012. ^ Goldberg, Lesley (January 14, 2013). "Scott Gimple Tapped as New 'Walking Dead' Showrunner". The Hollywood Reporter. Archived from the original on January 16, 2013. Retrieved January 14, 2013. ^ Goldberg, Lesley (March 12, 2013). "'Walking Dead' Adds Pair to Writers Room for Season 4". The Hollywood Reporter. Archived from the original on March 15, 2013. Retrieved March 14, 2013. ^ Otterson, Joe (January 13, 2018). "'Walking Dead' Names Angela Kang Showrunner, Scott Gimple Elevated to Chief Content Officer". Variety. Retrieved January 13, 2018. ^ Prudom, Laura (January 13, 2018). "The Walking Dead Renewed for Season 9, Angela Kang Promoted to Showrunner". IGN. Retrieved January 13, 2018. ^ a b Ross, Dalton (October 28, 2016). "The Walking Dead: Robert Kirkman explains why Glenn had to die". Entertainment Weekly. Archived from the original on October 29, 2016. Retrieved October 28, 2016. ^ a b Wigler, Josh (October 23, 2016). "'Walking Dead': How Main Characters Die on the Show vs. the Comics". The Hollywood Reporter. Archived from the original on October 27, 2016. Retrieved October 28, 2016. ^ Davis, Brandon (September 28, 2017). "Why 'The Walking Dead' Deviates From The Comics". Comicbook.com. Retrieved October 25, 2017. ^ Bradley, Laura (October 24, 2016). "How The Walking Dead's Latest Victim Lied to Everyone for a Year". Vanity Fair. Retrieved April 8, 2019. ^ Ross, Dalton (December 11, 2017). "The Walking Dead: Chandler Riggs on what's next for Carl". Entertainment Weekly. Retrieved April 8, 2019. ^ Ross, Dalton (July 30, 2018). "Andrew Lincoln reveals why he is leaving The Walking Dead". Entertainment Weekly. Retrieved July 30, 2018. ^ Otterson, Joe (November 5, 2018). "Andrew Lincoln to Star in Multiple 'Walking Dead' Movies for AMC". Variety. Retrieved November 5, 2018. ^ Trumbore, Dave (May 29, 2018). "Exclusive: Andrew Lincoln to Exit AMC's 'The Walking Dead' in Season 9". Collider. Retrieved May 29, 2018. ^ Bradley, Laura (August 6, 2018). "The Walking Dead Season 9 Will Take a Gut-Wrenching Cue from the Comics". Vanity Fair. Retrieved August 6, 2018. ^ Goldberg, Lesley (February 8, 2019). "'Walking Dead' Shocker: Danai Gurira to Exit". The Hollywood Reporter. Retrieved April 8, 2019. ^ O'Donnell, Sean (August 19, 2018). "Lennie James Reveals Why Morgan Moved To Fear The Walking Dead". Screen Rant. Retrieved September 10, 2018. ^ Romano, Nick (January 3, 2019). "The Walking Dead's Austin Amelio heads to Fear the Walking Dead for next crossover". Entertainment Weekly. Retrieved April 8, 2019. ^ Rowles, Dustin (April 17, 2019). "A New 'The Walking Dead' Cast Member Is Reportedly Being Paid More Than Andrew Lincoln In His 6th Season". Uproxx. Retrieved April 17, 2019. ^ Goldberg, Lesley (November 5, 2018). "'Walking Dead' Stars Ink Franchise Deals; Danai Gurira Eyes New Pact". The Hollywood Reporter. Retrieved April 17, 2019. ^ a b Warner, Kara (November 4, 2010). "Inside Bear McCreary's 'The Walking Dead' Theme: Making Music Out Of 'Nothing'". MTV News. MTV. Archived from the original on February 12, 2012. Retrieved February 22, 2012. ^ "The Walking Dead (AMC's Original Soundtrack – Vol. 1)". Amazon.com. Retrieved September 11, 2014. ^ "The Walking Dead — AMC Original Soundtrack, Vol. 2". Amazon.com. Retrieved September 11, 2014. ^ "The Walking Dead AMC Original Soundtrack – Volume 2 Now Available". AMC. August 27, 2013. Archived from the original on October 6, 2014. Retrieved September 11, 2014. ^ Bibel, Sara (July 24, 2014). "'Songs of Survival Volume 2' Available With 'The Walking Dead' Season Four DVD Set". TV by the Numbers. Archived from the original on October 14, 2014. Retrieved September 11, 2014. ^ Ayers, Mike (October 12, 2012). "What it takes to make a 'Walking Dead' zombie". CNN. Archived from the original on July 17, 2013. Retrieved July 13, 2013. ^ Hunter, Marnie (March 2, 2015). "'Walking Dead' in Georgia: Film tourism comes to life". CNN. Archived from the original on September 24, 2015. Retrieved August 10, 2015. ^ a b Lynch, Jason (April 9, 2017). "Georgia's TV and Film Industry Now Brings in $7 Billion a Year, Fueled by Smart Incentives". Ad Week. Retrieved October 24, 2017. ^ a b Pane, Lisa Marie (October 22, 2017). "'The Walking Dead' reaches 100th episode milestone". The Washington Post. Retrieved October 23, 2017. ^ a b Wigler, Josh (October 23, 2017). "'Walking Dead' Turns 100: Taking a Stroll Through the Show's Apocalyptic Set". The Hollywood Reporter. Retrieved October 23, 2017. ^ Ho, Rodney (August 4, 2017). "AMC buys 'The Walking Dead' studio for $8.25 million". The Atlanta Journal-Constitution. Retrieved October 24, 2017. ^ "Exclusive: The Walking Dead Set Visit Preview: Oh Yes, There Will Be Blood!". Dread Central. July 5, 2010. Archived from the original on July 14, 2010. Retrieved November 2, 2010. ^ Todd Debreceni (2013). Special Makeup Effects for Stage and Screen: Making and Applying Prosthetics. Taylor & Francis. pp. 290–. ISBN 978-0-240-81696-8. Archived from the original on April 16, 2017. ^ "The Walking Dead – About the Show". AMC. Archived from the original on April 10, 2011. Retrieved October 9, 2010. ^ Hibberd, James (October 25, 2010). "'Walking Dead' plans global zombie invasion stunt". The Hollywood Reporter. Archived from the original on October 28, 2010. Retrieved November 4, 2010. ^ Neuman, Clayton (July 20, 2010). "The Walking Dead Motion Comic Arrives Online". AMC. Archived from the original on July 23, 2010. Retrieved October 18, 2010. ^ Neuman, Clayton (October 11, 2010). "The Making of The Walking Dead Documentary". AMC. Archived from the original on October 15, 2010. Retrieved October 18, 2010. ^ Keck, William (June 15, 2011). "Keck's Exclusives: Walking Dead Ready for Action". TV Guide. Archived from the original on June 18, 2011. Retrieved June 15, 2011. ^ a b c d Hughes, Mark (January 25, 2013). "'The Walking Dead' Gets Green – Producer Gale Anne Hurd On How Zombies Are Saving The World". Forbes: 1 and 2. Archived from the original on January 27, 2013. Retrieved March 6, 2013. ^ a b Hughes, Mark (January 30, 2013). "Doddle Of The Dead — Putting The App In Zombie Apocalypse, Part 1". Forbes. Archived from the original on February 24, 2013. Retrieved March 6, 2013. ^ Hughes, Mark (January 31, 2013). "Doddle Of The Dead — Putting The App In Zombie Apocalypse, Part 2". Forbes. Archived from the original on February 20, 2013. Retrieved March 6, 2013. ^ "The Walking Dead Webisodes". AMC. Archived from the original on April 7, 2015. Retrieved April 9, 2015. ^ "The Walking Dead: Red Machete". TV Guide. Retrieved January 31, 2018. ^ "Motion Comic: The Walking Dead". AMC. Archived from the original on April 16, 2015. Retrieved April 16, 2015. ^ Bolomoro, Cameron (November 4, 2018). "Andrew Lincoln's Rick Grimes Is off 'The Walking Dead' for Good". Comicbook.com. Retrieved November 4, 2018. ^ Enger, Jeremy (November 4, 2018). "'The Walking Dead' Says Goodbye to Andrew Lincoln. Sort Of". The New York Times. Retrieved November 5, 2018. ^ Goldberg, Lesley (September 16, 2013). "'Walking Dead' Companion Series in the Works at AMC". The Hollywood Reporter. Archived from the original on September 18, 2013. Retrieved September 16, 2013. ^ Ausiello, Michael (March 9, 2015). "AMC's Walking Dead Spinoff Snags Two-Season Order, Premiere Date". TVLine. Archived from the original on March 9, 2015. Retrieved March 9, 2015. ^ Carle, Chris (March 27, 2015). "Walking Dead Spin-off Series Name Revealed". IGN. Archived from the original on March 28, 2015. Retrieved March 28, 2015. ^ Slezak, Michael (July 10, 2015). "Fear the Walking Dead Trailer Is Finally Here! (And So's the Premiere Date!)". TVLine. Archived from the original on July 11, 2015. Retrieved July 10, 2015. ^ Bradley, Laura (October 8, 2017). "The Walking Dead Will Cross Over with Fear the Walking Dead—But How?". Vanity Fair. Retrieved November 10, 2017. ^ Fowler, Matt (November 26, 2017). "Walking Dead / Fear the Walking Dead Crossover". IGN. Retrieved November 26, 2017. ^ Davis, Brandon (January 3, 2019). "'The Walking Dead' Star Joins 'Fear' for Another Crossover". Comicbook.com. Retrieved January 3, 2019. ^ Hayes, Dade; Patten, Dominic (February 28, 2019). "New 'Walking Dead' Spinoff In The Works, AMC Executives Confirm". Deadline Hollywood. Retrieved February 28, 2019. ^ Goldberg, Lesley (April 8, 2019). "'The Walking Dead': Third Series Officially a Go at AMC". The Hollywood Reporter. Retrieved April 8, 2019. ^ "AMC Greenlights Third Series in "The Walking Dead" Universe". The Futon Critic. April 8, 2019. ^ Lazar, Shira (February 15, 2013). "The Best Walking Dead Parodies on YouTube". The Huffington Post. Archived from the original on December 13, 2014. Retrieved July 7, 2014. ^ Arthurs, Deborah (April 6, 2012). "Mad Men meets Walking Dead: Don Draper devours his secretary as ad agency is invaded by zombies in hilarious spoof". Daily Mail. Archived from the original on April 6, 2012. Retrieved July 7, 2014. ^ Couch, Aaron (March 3, 2013). "'Saturday Night Live' spoofs 'The Walking Dead'". Today.com. Archived from the original on July 14, 2014. Retrieved July 7, 2014. ^ Lederer, Donnie (September 28, 2016). "This WALKING DEAD Parody Reveals Negan's Victim… Right After This Coffee Break". Nerdist. Archived from the original on September 20, 2016. Retrieved September 20, 2016. ^ Borns, Joanna (May 3, 2013). "'The Walking Dead' Gets 'Bad Lip Reading' Treatment (VIDEO)". The Huffington Post. Archived from the original on July 15, 2014. Retrieved July 7, 2014. ^ "The Walking Dead breakfast (The Governor reacts to Bad Lip Reading)". YouTube. July 23, 2013. Archived from the original on April 24, 2014. Retrieved July 7, 2014. ^ Taylor, Alice (August 16, 2013). "Walking Dead Edinburgh Review". ThreeWeeks. Archived from the original on December 20, 2016. Retrieved January 2, 2017. ^ Miska, Brad (July 13, 2010). "SD Comic-Con 2010: The Walking Dead Promotional One-Sheet". Dread Central. Archived from the original on July 14, 2010. Retrieved July 13, 2010. ^ "The Walking Dead Premieres Halloween; Comic-Con Trailer Now Online". AMC. August 24, 2010. Archived from the original on August 27, 2010. Retrieved August 24, 2010. ^ "FOX International Channels (FIC) and AMC Announce a Global Launch for the Highly Anticipated TV Drama Series The Walking Dead". Fox International Channels. August 24, 2010. Archived from the original on May 18, 2015. Retrieved July 25, 2011. ^ Ernesto (October 21, 2010). "The Walking Dead TV-Series Premieres On BitTorrent". TorrentFreak. Archived from the original on October 24, 2010. Retrieved October 22, 2010. ^ Fernandez, Joe (June 14, 2010). "FX signs global broadcast rights to The Walking Dead". Marketing Week. Archived from the original on September 27, 2013. Retrieved December 19, 2011. ^ "The Walking Dead Season 5 Premieres Worldwide Just 24 Hours After US Broadcast". Fox International Channels. July 26, 2014. Archived from the original on December 13, 2014. Retrieved December 6, 2014. ^ "FOX International Channels Rolls Out First-Ever Global Brand Strategy on 126 FOX Channels with Return of Global Hit Series 'The Walking Dead'". Fox International Channels. January 21, 2015. Archived from the original on February 17, 2015. Retrieved February 17, 2015. ^ "The Walking Dead Season 1 DVDs Now Available for Pre-Order". AMC. December 2, 2010. Archived from the original on December 6, 2010. Retrieved December 6, 2010. ^ Lacy, Gord (July 21, 2011). "The Walking Dead – Press Release for Season 1 Special Edition". TVShowsOnDVD.com. Archived from the original on July 23, 2011. Retrieved July 21, 2011. ^ "Walking Dead, The (Comparison: European Version (e.g. UK BD) – US Version)". Movie-Censorship.com. Archived from the original on September 10, 2012. Retrieved August 1, 2011. ^ "Walking Dead, The (Comparison: European Version (e.g. UK BD) – US Version)". Movie-Censorship.com. Archived from the original on September 5, 2012. Retrieved August 22, 2011. ^ "Walking Dead, The (Comparison: European Version (e.g. UK BD) – US Version)". Movie-Censorship.com. Archived from the original on January 29, 2013. Retrieved August 22, 2011. ^ "Walking Dead, The (Comparison: European Version (e.g. UK BD) – US Version)". Movie-Censorship.com. Archived from the original on September 6, 2012. Retrieved August 1, 2011. ^ "The Walking Dead – Die komplette erste Staffel (Special Uncut Version)" [The Walking Dead – The complete first season (Special Uncut version)] (in German). Archived from the original on October 26, 2013. ^ Lacey, Gord (May 30, 2012). "The Walking Dead – '2nd Season' Press Release: Trailer, Final Details, Art for DVD, Blu-ray, Limited BD". TVShowsOnDVD.com. Archived from the original on April 5, 2014. Retrieved August 29, 2013. ^ Miller III, Randy (August 25, 2013). "The Walking Dead: Season Three [Limited Edition Aquarium Tank] (Blu-ray)". DVD Talk. Archived from the original on August 29, 2013. Retrieved August 29, 2013. ^ Lambert, David (June 24, 2014). "The Walking Dead – Anchor Bay's Official Press Release for 'The Complete 4th Season'". TVShowsOnDVD.com. Archived from the original on January 3, 2015. Retrieved January 3, 2015. ^ Fitzpatrick, Kevin (March 31, 2015). "'The Walking Dead' Season 5 Sets August Blu-ray Release Date, Cover Art". ScreenCrush. Archived from the original on April 30, 2016. Retrieved May 1, 2015. ^ "The Walking Dead: The Complete Sixth Season Blu-ray". Blu-ray.com. June 21, 2016. Retrieved June 23, 2018. ^ "The Walking Dead: The Complete Seventh Season Blu-ray". Blu-ray.com. July 28, 2017. Retrieved June 23, 2018. ^ "The Walking Dead: The Complete Eighth Season Blu-ray". Blu-ray.com. June 20, 2018. Retrieved June 23, 2018. ^ Andreeva, Nellie (March 19, 2014). "MyNetworkTV Acquires Off-Network Rights To AMC's 'The Walking Dead'". Deadline Hollywood. Penske Business Media. Archived from the original on October 6, 2014. Retrieved October 2, 2014. ^ Hibberd, James (March 19, 2014). "'The Walking Dead' family friendly edited version coming to broadcast". Entertainment Weekly. Archived from the original on October 4, 2014. Retrieved October 2, 2014. ^ a b "The Walking Dead: Season 1 (2010)". Rotten Tomatoes. Archived from the original on October 5, 2013. Retrieved October 4, 2013. ^ a b "The Walking Dead: Season 1". Metacritic. Archived from the original on November 27, 2015. Retrieved November 27, 2015. ^ a b "The Walking Dead: Season 2 (2011–2012)". Rotten Tomatoes. Archived from the original on October 5, 2013. Retrieved October 4, 2013. ^ a b "The Walking Dead: Season 2". Metacritic. Archived from the original on March 16, 2014. Retrieved November 27, 2015. ^ a b "The Walking Dead: Season 3 (2012–2013)". Rotten Tomatoes. Archived from the original on October 5, 2013. Retrieved October 4, 2013. ^ a b "The Walking Dead: Season 3". Metacritic. Archived from the original on December 27, 2012. Retrieved November 27, 2015. ^ a b "The Walking Dead: Season 4 (2013–2014)". Rotten Tomatoes. Archived from the original on August 21, 2014. Retrieved December 10, 2013. ^ a b "The Walking Dead: Season 4". Metacritic. Archived from the original on February 9, 2014. Retrieved November 27, 2015. ^ a b "The Walking Dead: Season 5 (2014–2015)". Rotten Tomatoes. Archived from the original on February 3, 2015. Retrieved January 22, 2015. ^ a b "The Walking Dead: Season 5". Metacritic. Archived from the original on November 10, 2015. Retrieved November 27, 2015. ^ a b "The Walking Dead: Season 6 (2015)". Rotten Tomatoes. Archived from the original on November 21, 2015. Retrieved December 6, 2015. ^ a b "The Walking Dead: Season 6". Metacritic. Archived from the original on November 21, 2015. Retrieved November 27, 2015. ^ a b "The Walking Dead: Season 7 (2016)". Rotten Tomatoes. Archived from the original on December 2, 2016. Retrieved December 1, 2016. ^ a b "The Walking Dead: Season 8 (2017)". Rotten Tomatoes. Retrieved March 1, 2018. ^ a b "The Walking Dead: Season 9". Rotten Tomatoes. Retrieved October 7, 2018. ^ a b "The Walking Dead: Season 9". Metacritic. Retrieved October 1, 2018. ^ Havrilesky, Heather. "Don't miss these 9 new TV shows". Salon. Archived from the original on October 20, 2011. Retrieved October 24, 2010. ^ Tucker, Ken (November 28, 2011). "'The Walking Dead' and 'Pretty Much Dead Already': A cheap thrill-kill, or new life for the season?". Entertainment Weekly. Archived from the original on February 8, 2012. Retrieved February 9, 2012. ^ Rawlings, Nate (November 28, 2011). "Walking Dead Recap: Pretty Much Dead Already". Time. Archived from the original on February 8, 2012. Retrieved February 12, 2012. ^ Wampler, Scott (March 18, 2012). "'The Walking Dead' Season Finale Recap: "Beside the Dying Fire"". Collider.com. Archived from the original on October 11, 2012. Retrieved October 11, 2012. ^ Yeoman, Kevin (March 19, 2012). "'The Walking Dead' Season 2 Finale Review". Screen Rant. Archived from the original on February 10, 2015. Retrieved February 10, 2015. ^ Gay, Verne (October 11, 2012). "'The Walking Dead' season 3 doesn't disappoint". Newsday. Archived from the original on October 13, 2012. Retrieved October 11, 2012. ^ "The Walking Dead Is First Cable Series to Beat Every Show of Fall Broadcast Season In Adult 18–49 Rating". AMC. December 2012. Archived from the original on February 23, 2016. Retrieved February 21, 2016. ^ Kissell, Rick (February 17, 2016). "Ratings: 'The Walking Dead' Down, Still Huge in Return; Small Tune-In for HBO's 'Vinyl'". Variety. Archived from the original on February 21, 2016. Retrieved February 21, 2016. ^ Bibel, Sara (March 30, 2015). "'The Walking Dead' Season 5 Finale is Highest Rated Finale in Series History, Garnering 15.8 Million Viewers". TV by the Numbers. Archived from the original on June 2, 2015. Retrieved June 4, 2015. ^ a b Bibel, Sara (October 13, 2014). "'The Walking Dead' Season 5 Premiere Hits Series High Ratings in Adults 18–49 & Viewers". TV by the Numbers. Archived from the original on April 19, 2015. Retrieved October 13, 2014. ^ Katz, Josh (December 27, 2016). "'Duck Dynasty' vs. 'Modern Family': 50 Maps of the U.S. Cultural Divide". The New York Times. Archived from the original on March 29, 2017. Retrieved December 28, 2016. ^ Seidman, Robert (November 2, 2010). "Sunday Cable Ratings: The Walking Dead Kills; Boardwalk Empire Steady; + Swamp People, Dexter, Ghost Hunters Live & Much More". TV by the Numbers. Archived from the original on November 19, 2010. Retrieved November 3, 2010. ^ Gorman, Bill (December 7, 2010). "Sunday Cable Ratings: 'The Walking Dead,' 'Boardwalk Empire' Finales Rise; 'Sarah Palin's Alaska,' 'Dexter,' 'The Hasslehoffs' & More". TV by the Numbers. Archived from the original on December 11, 2010. Retrieved December 8, 2010. ^ Seidman, Robert (October 18, 2011). "Sunday Cable Ratings: 'The Walking Dead' Doubles NLCS + NJ Housewives, 'Boardwalk Empire,' 'Talking Dead,' 'Dexter' & Much More". TV by the Numbers. Archived from the original on October 20, 2011. Retrieved October 18, 2011. ^ Bibel, Sara (March 20, 2012). "Sunday Cable Ratings: 'Walking Dead' Season Finale Laps the Field + 'Khloe & Lamar,' 'Frozen Planet,' 'Army Wives' & More". TV by the Numbers. Archived from the original on March 22, 2012. Retrieved March 20, 2012. ^ Harnick, Chris (March 19, 2012). "'The Walking Dead' Ratings: Season 2 Finale Shatters Records". The Huffington Post. Archived from the original on July 27, 2012. Retrieved October 23, 2012. ^ Bibel, Sara (October 16, 2012). "Sunday Cable Ratings:'The Walking Dead' Dominates Night, Space Jump, 'Dexter', 'Boardwalk Empire','Homeland,' 'Breaking Amish', & More". TV by the Numbers. Archived from the original on October 18, 2012. Retrieved October 16, 2012. ^ Hibberd, James (April 1, 2013). "'Walking Dead' finale breaks series records". Entertainment Weekly. Archived from the original on April 3, 2013. Retrieved April 1, 2013. ^ "The Walking Dead: Season Three Ratings". TV Series Finale. April 2, 2013. Retrieved July 26, 2017. ^ Bibel, Sara (October 14, 2013). "'The Walking Dead' Season 4 Premiere is Highest Rated Episode Ever With 16.1 Million Viewers & 10.4 Million Adults 18–49". TV by the Numbers. Archived from the original on October 17, 2013. Retrieved October 14, 2013. ^ Bibel, Sara (April 1, 2014). "Sunday Cable Ratings: 'The Walking Dead' Wins Night, 'Talking Dead', 'Real Housewives of Atlanta', 'Shameless', Naked and Afraid' & More". TV by the Numbers. Archived from the original on April 4, 2014. Retrieved April 1, 2014. ^ "The Walking Dead: Season Four Ratings". TV Series Finale. April 1, 2014. Retrieved July 26, 2017. ^ Bibel, Sara (March 31, 2015). "Sunday Cable Ratings: 'The Walking Dead' Tops Night, 'Talking Dead', 'Real Housewives of Atlanta', 'Going Clear', 'Killing Jesus' & More". TV by the Numbers. Archived from the original on April 1, 2015. Retrieved March 31, 2015. ^ "The Walking Dead: Season Five Ratings". TV Series Finale. March 31, 2015. Retrieved July 26, 2017. ^ Porter, Rick (October 13, 2015). "Sunday cable ratings: 'Walking Dead' premiere down but still utterly dominant". TV by the Numbers. Archived from the original on October 13, 2015. Retrieved October 13, 2015. ^ Porter, Rick (April 5, 2016). "Sunday cable ratings: 'Walking Dead' finale scores its best rating of 2016". TV by the Numbers. Archived from the original on April 6, 2016. Retrieved April 5, 2016. ^ "The Walking Dead: Season Six Ratings". TV Series Finale. April 5, 2016. Retrieved July 26, 2017. ^ Porter, Rick (April 4, 2017). "Sunday cable ratings: 'The Walking Dead' finale lowest since Season 2". TV by the Numbers. Archived from the original on April 4, 2017. Retrieved April 4, 2017. ^ "The Walking Dead: Season Seven Ratings". TV Series Finale. April 4, 2017. Retrieved July 26, 2017. ^ "The Walking Dead: Season Eight Ratings". TV Series Finale. April 17, 2018. Retrieved April 17, 2018. ^ "The Walking Dead: Season Nine Ratings". TV Series Finale. April 2, 2019. Retrieved April 2, 2019. ^ "AFI Awards". AFI.com. Archived from the original on August 17, 2016. Retrieved December 13, 2010. ^ "'Inception,' 'Walking Dead' Top Saturn Awards Nominations". The Hollywood Reporter. February 24, 2011. Archived from the original on June 29, 2011. Retrieved February 24, 2011. ^ Ausiello, Michael (June 6, 2011). "Mad Men, Fringe, Good Wife, Modern Family, Community, Justified Lead Critics Choice Kudos". TVLine. Archived from the original on June 8, 2011. Retrieved June 8, 2011. ^ "Emmy Nominations 2011: Full List". The Hollywood Reporter. July 14, 2011. Archived from the original on November 2, 2012. Retrieved July 14, 2011. ^ "2011 Primetime Creative Arts Emmy Awards Winners". Academy of Television Arts & Sciences. September 10, 2011. Retrieved September 19, 2011. ^ Tapley, Kristopher (March 3, 2015). "'Captain America,' 'The Walking Dead' lead 2015 Saturn Awards nominations". HitFix. Archived from the original on March 7, 2015. Retrieved March 4, 2015. ^ a b c d Masters, Kim; Belloni, Matthew (December 17, 2013). "Fired 'Walking Dead' Creator Frank Darabont Sues AMC for Profits". The Hollywood Reporter. Archived from the original on November 16, 2016. Retrieved September 27, 2016. ^ Masters, Kim (August 10, 2011). "'The Walking Dead': What Really Happened to Fired Showrunner Frank Darabont". The Hollywood Reporter. Archived from the original on August 13, 2011. Retrieved August 10, 2011. ^ Gardner, Eriq (May 19, 2014). "AMC Resists Frank Darabont's Inquiry Into 'Fair Market Value' of 'The Walking Dead'". The Hollywood Reporter. Archived from the original on October 12, 2016. Retrieved September 27, 2016. ^ Gardner, Eriq (June 19, 2014). "AMC Must Hand Over 'Mad Men,' 'Breaking Bad' Deals to Frank Darabont's Attorneys". The Hollywood Reporter. Archived from the original on October 12, 2016. Retrieved October 3, 2016. ^ Gardner, Eriq (January 6, 2016). "'Walking Dead' Creator Frank Darabont's Deposition Unsealed: "We Had Crisis-Level Problems"". The Hollywood Reporter. Archived from the original on September 16, 2016. Retrieved September 27, 2016. ^ Gardner, Eriq (August 4, 2015). "Frank Darabont Says AMC Reduced His Profit Share After 'Walking Dead' Lawsuit". The Hollywood Reporter. Archived from the original on October 12, 2016. Retrieved September 27, 2016. ^ Gardner, Eriq (February 9, 2016). "Frank Darabont Given Green Light to Pursue Larger Cut of 'Walking Dead' Profits". The Hollywood Reporter. Archived from the original on October 7, 2016. Retrieved September 27, 2016. ^ Gardner, Eriq (September 27, 2016). "Frank Darabont to Seek More Than $280 Million From AMC at 'Walking Dead' Profits Trial". The Hollywood Reporter. Archived from the original on September 28, 2016. Retrieved September 27, 2016. ^ Gardner, Eriq (July 13, 2017). "'Walking Dead' Lawsuit Spills Obscene Emails and Tales of Greed Over TV's Billion-Dollar Hit". The Hollywood Reporter. Retrieved August 15, 2017. ^ Gardner, Eriq (January 18, 2018). "Frank Darabont, CAA Launch Second 'Walking Dead' Lawsuit Against AMC". The Hollywood Reporter. Retrieved March 19, 2018. ^ Patton, Dominic (October 26, 2018). "'Walking Dead' Suit "Minor" Profit Reports Tug Of War Ends; AMC Lets Go Of Rope". Deadline Hollywood. Retrieved October 26, 2018. ^ Patton, Dominic (December 10, 2018). "'Walking Dead' $300M Lawsuit Looks Trial Bound; AMC's Move To Dismiss Denied Yet Cabler Claims "Victory"". Deadline Hollywood. Retrieved December 10, 2018. ^ Patton, Dominic (February 5, 2019). "'Walking Dead' $300M Lawsuit Finally Gets A Trial Date & A New Judge". Deadline Hollywood. Retrieved February 5, 2019. ^ Gardner, Eriq (August 14, 2017). "'Walking Dead' Producers Claim Massive AMC Profits Scam in New Lawsuit". The Hollywood Reporter. Retrieved August 15, 2017. ^ Patten, Dominic (October 23, 2017). "'Walking Dead' EPs Get Big-Bucks Profits Suit Against AMC Set In California". Deadline Hollywood. Retrieved October 24, 2017. ^ Patten, Dominic (August 17, 2017). "'The Walking Dead' EPs Promise To Be "Partners" With AMC As They Sue Cabler In NY Over Profits – Update". Deadline Hollywood. Retrieved October 24, 2017. Wikimedia Commons has media related to The Walking Dead. This page was last edited on 23 April 2019, at 15:26 (UTC).